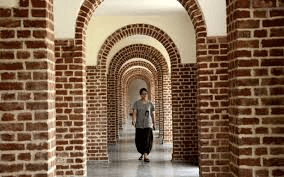 The hostel is laid out in an aesthetically designed quadrangle enclosing well maintained gardens paced out by a majestic bottle palm lined pathway. The long corridors, the dining hall with a high arched ceiling, and stonework balconies add to its charm. Over the last few years, extensive restoration and refurbishment work has been undertaken to preserve its red brick facade and unique interiors. A new hostel block was added in 2012. It matches in grandeur the old Walter George building. Sitting smugly on the periphery of the old hostel, it integrates well and adds equal beauty and grace to the campus. It is a privilege to reside in the hostel as it provides excellent modern facilities. Each room has ergonomically designed furniture and has been aesthetically furnished. The liberal, nurturing environment provides students a home away from home. Rooms: Miranda House Hostel offers accommodation on twin-sharing basis. In addition, 4 rooms are 4-seaters. All rooms are fully furnished. These have ergonomically designed furniture that includes a single bed with storage box and drawer and fitted mattress, bedside table, dresser, cupboard, study desk, overhang book case and chair, for individual use. Furnishing and linen are provided to each student. Rooms are not air-conditioned. Desert coolers or room heaters are not allowed. Toilet Blocks: Each wing has a toilet block with hygienic facilities, geysers, and solar heaters for hot water. Pantry: Each wing provides access to a shared Pantry having a refrigerator, microwave oven, kettle, induction cooker, and essential cookware for student use. Drinking Water: Each wing has a Water Cooler served by water purified by an Industrial RO. 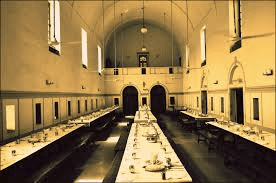 Dining Hall: The dining hall has a seating capacity of more than 200. Dining Hall Kitchen: This is fully equipped with industrial burner stoves, cookers, ovens, tandoor, automated grinders, mixers, dough kneader, vegetable peelers, etc. The kitchen has stores for groceries, non-perishable and perishable food items and separate areas for storing, processing and cooking non-vegetarian food. An IFB Industrial Dish Washer provides hygienic cleaning of utensils. College Eateries: Residents have easy access to college eateries that include the Canteen, Nescafe outlet, and Pizzas and More (PAM) outlet during college hours. Night Dhaba: This facility run by the canteen contractor provides snacks to resident students from 9.00 pm to 10.30 pm. Launderette: The Hostel has an in-house launderette that has IFB Washing Machines and Dryers operated by specially engaged staff. A schedule has been drawn for use of Launderette by student residents of different wings. Students are encouraged to use this facility as per norms and schedule. Ironing facility is available on payment of charges. Wi Fi: The entire college and the Hostel are Wi Fi enabled. Laptops: Residents are permitted to bring their own laptops. The college also issues laptops to students desirous of availing the facility. Digital Resource Centres: The Hostel has a dedicated Digital Resource Centre with desktop computers and a printer-scanner. 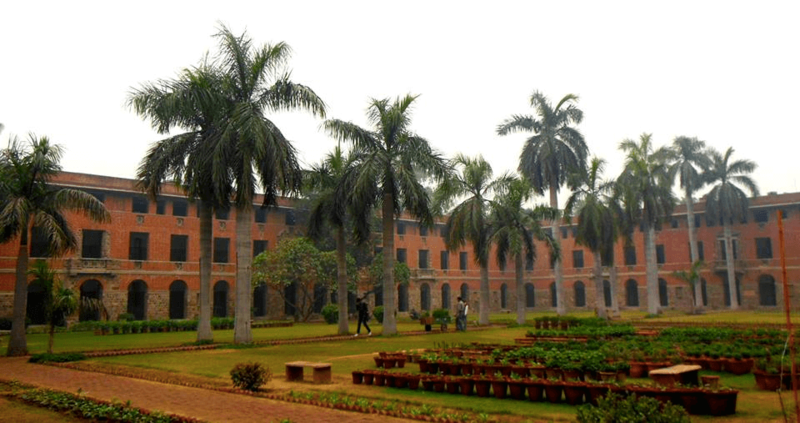 The facility is maintained by the Hostel Students Union. Residents also have access to the Digital Resource Centre located in room numbers 107-108 of the academic block, from Monday to Friday from 8.30 am to 7.30 pm. Reading Room: Resident students can use the Heritage Hall located within the hostel premises for various academic activities after 7.30 pm. Library: Resident students have access to college library which is kept open till 7.30 pm. Auditorium: Resident students are free to book the college auditorium for cultural activities. Sports Facilities: These are shared with the college. Students are encouraged to use the Fitness Centre and outdoor courts and also enroll in Aerobics, Yoga and Taekwondo sessions specially organized for them. Common Rooms: The old and new hostel blocks have a common room, each. Each has installed a television set with DTH connection and a home theatre. Visitors Arcade: Seating is provided in the arcade at the entrance of the hostel. Public Address System: The visitor's arcade has a Public Address System that can be used to communicate with students across the hostel. Gen Set: Electricity supply is 24 hours and connected to College Gen Set in case of outage. Services: Electrician and plumber are on 24 hour call. Sanitation: Special focus is on cleanliness, health and hygiene. Adequate sanitation and garden staff take care of the estate. Administration: The Hostel Office is open from 8.30 am to 5.00 pm. Wardens: There are 2 wardens and one of them is always available in the hostel throughout the week. One of the wardens resides on the campus in quarters reserved for her. She takes care of any medical emergency in the night hours. Guest Accommodation: One fully furnished air-conditioned Guest Room is available for a maximum of three days for parents on payment basis. Advance booking is required. Security: Dedicated round-the-clock security guards have been employed. A Medical Support Unit was established at Miranda House, located within the hostel in January 2014. It is a facility shared with the college. It augments the prevalent arrangement where all students in residence are compulsorily members of World University Service (WUS) Health Centre, University of Delhi, located at V. P. Patel Chest Institute, across the road from Miranda House. WUS provides basic medical facilities to the students. The in-house medical unit is well equipped and professionally supported by neighborhood Hospital Nu Life. A Nurse is on duty 6 days of the week from Monday to Saturday, 9.30 a.m to 4.30 p.m. A well qualified doctor is available for consultation 3 days a week in the forenoon. This facility is ideal for regular health check up and treating common medical issues like cough and cold, indigestion, minor cuts, bruises, aches, pains, sports injuries and mild fever, et cetera. The centre stocks emergency medicines for allergy, pain, fever, asthama, and other common ailments. Sickbay: A Sick Room with 2 medical beds and a patient attendant bed is located across the doctor's consultation room and warden's quarters. Necessary medical equipment available in the medical room includes Blood Pressure Machine, Glucometer, Nebulizer, Oxygen Cylinder, Glucose drip, etc. Medical Emergency Protocol: The college has a well defined protocol for efficient handling of medical emergencies, at all hours. A wheel Chair, stretcher and transport are readily available. With first aid provided, the student is rushed to WUS for professional advise. If recommended, the student is shifted to a well recognized neighborhood hospitals like Bara Hindu Rao and St. Stephens Hospital, accompanied by the warden. The Principal and the hostel committee faculty members are kept informed. Local guardians and parents are also informed early and consulted for course of action. The college accords high priority to the counseling process, given the fact that nearly 70% students come from outside Delhi, several are first generation learners and the full range of diversity exists within the college community, be it in terms of differing socio-economic and educational backgrounds, differing ethnicities, cultures, religious affiliations, or student's abilities. Problems of relocation, sudden independence, social activity, technology mediated social networks, peer pressure, and intense competition pose several challenges to the individual. Counseling is used to provide timely help to students having emotional, behavioral, academic, social or other adjustment concerns. Although the teacher-student bonds at Miranda House are very strong, mentoring is often not enough and professional quality mental health interventions are often necessary to help students establish realistic goals and develop active short-term treatment solutions. Psycho-Social Counseling and Guidance Centre: The college has established a Counseling Centre on the campus. Its mission is to enhance student wellbeing and offer them a meaningful and successful college experience. This entails helping them evolve as confident and well-adjusted young women capable of handling any situation. A professionally trained counselor Ms. Alpana Rustogi is available on three days of the week on Mondays, Wednesday and Fridays from 11.30 a.m. till 5.00 p.m. in the hostel. She is also available on call as and when required. The facility is available to day scholars as well. The college's stated policy of affirmation of diversity is respected and followed at all times. All services are provided in a strictly confidential and professional atmosphere with respect for diversity and sensitivity as its hallmark. In addition to counseling, various empowerment activities are taken up during the session for increasing awareness and in aiding the personal skill-building and personality development of the students and staff. In the academic year 2015-16, an essential part of Counseling outreach was knowledge dissemination through posters on topics like Exam and Study Skills, Anger Management, Anxiety and Fear, Peer Pressure, Productivity, Self-esteem and Developing Hobbies; art therapy sessions; and continual workshops sparking conversations about mental health issues. Important sessions included Strengthening Team Work and Focus on Health and Hygiene, a survey and discussion organized for the mess employees on waste management and work morale a workshop on Understanding the Growing Need for Counseling and the Counseling Process targeted at Hostel students and an interactive talk on Managing Stress delivered to NSS volunteers. Academic Counseling: This begins from the time of admission when the faculty members deputed at the Public Relations Office answer queries of prospective students unable to makeup their mind on what course to choose. The department faculty also assist students seeking advise, particularly in B.A. Programme wherein a large number of course combinations are on offer. The dilemma of choice is again visible when students select from options available for Generic Elective, Interdisciplinary, Concurrent courses, etc. For second and third year students, departments often organize orientation programmes and road shows to enable well informed choice. Students are encouraged to seek personal advice when doubts persist. Subsequently, students fill well-designed survey form on basis of which they are allocated optional courses. This data becomes the basis for organization of teaching. Students are given a chance to change the option up to an announced date. Individualized counseling becomes necessary in rarest of rare case where a course cannot be offered because of lack of viable number of students or when a student remains unsure despite extensive discussions. Career and Education Advancement Guidance: The faculty contributes to the education and career advancement of students in a variety of ways. Students are always encouraged to discuss their plans related to higher study including research and their choice of career. They are encouraged and guided to appear for the entrance exams for post-graduate studies in prestigious institutions and universities in and outside the country. The help rendered includes rigorous discussion on course material, books, approaches to problems and perspectives and on research proposals. The continuous interest taken in the academic and career choices of students which includes teaching, the administrative services, publishing, the mass media and pure research, contributes to an abiding and enriching relationship of the students with the faculty and the institution.